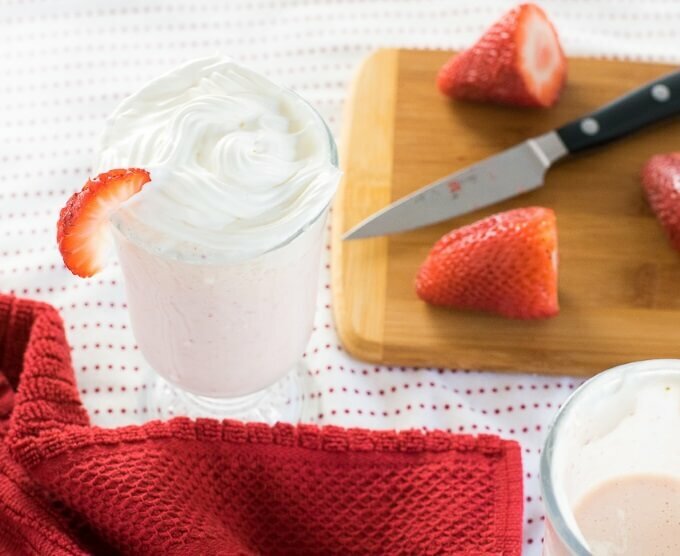 Making a Strawberry Banana Milkshake couldn’t be any easier. Add these simple ingredients to a blender and enjoy! Who makes milkshakes during a polar vortex? This guy! If you are going to be freezing cold, you might as well be slurping a tasty treat. Milkshakes are a classic summer treat but really they are great to enjoy any time of the year! 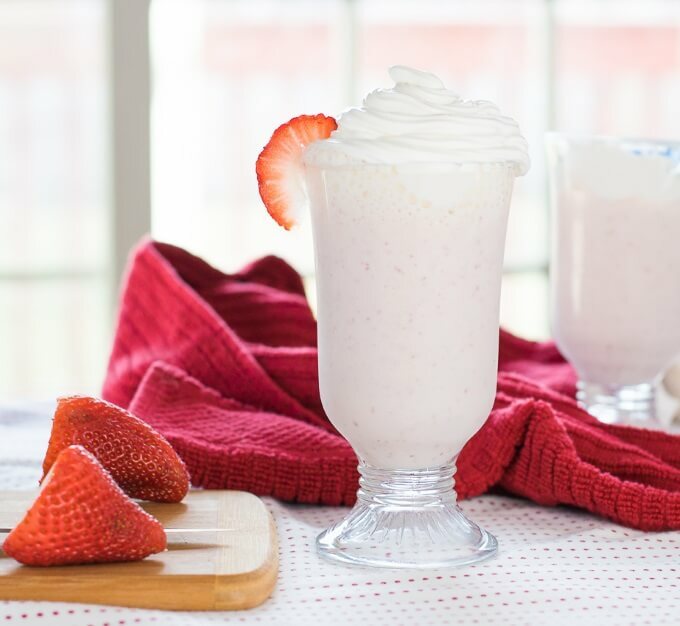 These Strawberry Banana Milkshakes are crafted with simple ingredients. Strawberries, bananas, ice cream, milk, and a little vanilla extract. Many of these ingredients you likely already have in your kitchen. Feel free to get creative and substitute your favorite fruits or ice cream flavors. This recipe is highly customizable and can be made without ice cream if you are looking to make a healthy milkshake. Simply substitute frozen yogurt instead. Using frozen yogurt won’t yield quite as creamy of a milkshake, but it still tastes great! Milkshakes are simple to make because there is no cooking involved. Each of the ingredients is just added to your blender and pureed until smooth. If you like the milkshake thicker, add less milk. If you like a thinner milkshake, add more milk. You can recreate a fun classic diner experience by serving milkshakes with homemade burgers and French fries. Your family will love resurrecting this 1950s classic! 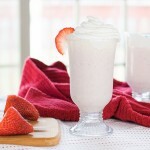 A Strawberry Banana Milkshake is the ideal frosty treat to celebrate childhood and sunny warm days! Add all ingredients to a blender and puree till mixture is smooth and fully combined. Pour into two glasses and top with whipped cream if desired. These ingredients can all be adjusted to fit your tastes and preferred thickness. Feel free to substitute frozen yogurt for a healthier treat. IF YOU ENJOYED THIS RECIPE check out my Oreo Fluff recipe as well! 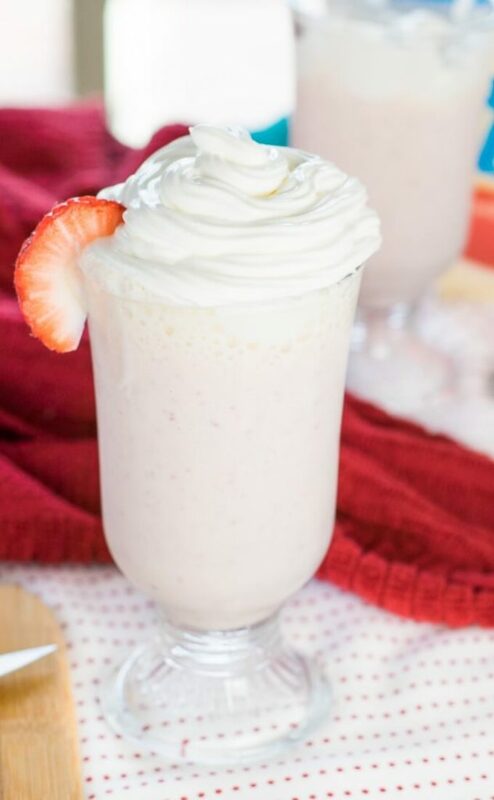 If you enjoyed my Strawberry Banana Milkshake recipe then you should probably like me on Facebook and follow me on Pinterest too. That’s what I would do at least, because if you don’t get to know me but you still use my recipe it is kind of like taking candy from a stranger, and your mom taught you not to do that. Don’t disobey your mom, subscribe to Fox Valley Foodie today. This shake looks delicious! I know my daughter would love it too!! Haven’t tried it yet, but sounds delicious! Thanks for the tip about Sir Bananas Milk. Had never heard of it, but will look for it at Wal Mart next time I go. Hope my Wal Mart carries it. This was really delicious! Thanks for sharing!